Those who know me know that I like shoes. So much of our lives is spent on our feet that having the right footwear is a must. Usually this means a pair of Converse All Stars, of which I own 15 pairs, or Vibram FiveFingers; 4 pairs. I also like "free" in fact it's my favorite price for the things I want to buy. Today these two sources of happiness came together in a truly epic way. Inov8, one of the shoe companies we stock where I work, was gracious enough to provide me with a free pair of their Road-X Lite 155 running shoes. As previously stated I pretty much live in my Chucks and FiveFingers and for well over a year the Fives have been the only running shoe I would use. And while I'm not retiring the Fives I have finally found another running shoe worth using. And they were free. And they're a ridiculously loud yellow which while not as ridiculous as toes shoes and maybe not quite as stylish as the Chucks still makes me smile. 'Cause thats what ridiculous things do; they make me smile. 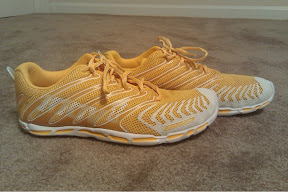 I can't wait to actually have a chance to get out and run in them. Maybe tomorrow. But now it's bedtime. The midnight showing of Captain America was well worth the loss of sleep but the Sandman is calling to collect and much like our great nation I've reached my debt ceiling and it's time to cut the deficit spending and pay the time I owe. If only the senate and congress would do the same. More on the movie and maybe first impressions of the 155's running performance next time.